Testimonials - Alpine Cabinet Company "
I just wanted to let Alpine Cabinet Company know how extremely pleased I am with the overall experience of buying cabinet with you. I am delighted with the quality of cabinets that I ordered recently. I couldn’t have asked better cabinets! The counter tops, shelves, and even drawer glides exceeded my expectations and I now know how Alpine has stayed in business for all these years. Not only is the quality of work excellent but the employees have been wonderful to work with. The gentleman that originally came out to measure my garage was very pleasant. Todd was very knowledgeable and seemed as though he had been in the business for several years. He provided me with many different options that would work best in my garage. The excellent service didn’t stop there. A few weeks later all the cabinets were delivered by two additional men (Travis and Keith). I am a mother of two young children and really appreciated they were very professional looking, personable and qualified. I was impressed when the showed up on time and in uniform (that isn’t standard for many businesses). The gentlemen did a terrific job installing the cabinets! They were here for over 5 hours to complete the job and now my garage looks amazing. My husband and I filled the cabinets shortly after they left and stood in amazement. We have had many neighbors come over and tell us how wonderful our garage looks. 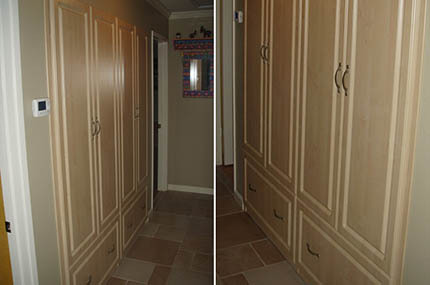 Again, I just wanted to let you know how wonderful Alpine’s service was and how happy I am with my cabinets. Thank you Alpine! First I must explain why I am writing a letter to you. I have had cabinets in our garages for many years. I started with shelves with curtains hiding our stuff. Then I had lots of others that only hid stuff, but were not really functional. My letter to you is to thank you for designing a cabinet with strong movable shelves that do not have a center brace and this is really strong. Christmas is over and all the trees and decorations are put away. Your big plastic bins work just wonderful. Before Alpine Cabinet Company I had to stack bigger items over the cabinet because they just didn’t fit; now everything is put away. Today, I bought new luggage and my husband bought a new golf bag. Normally that would be a problem but all my husband had to do was rearrange the shelves with your Alpine Cabinet clips. We feel very comfortable knowing the shelves will not bend or fall. Thank you again for making my husband’s job a lot easier. As you can tell by my letter I want everything perfect. We are a strong admirer of Alpine. The People that own this company are as good as it gets. I recently experienced an act of kindness I never expected in this day and age. Accidentally bumped into my alpine cabinet installed over 13 years ago. I called and then took the damaged door to Alpine. They looked at it and said it could be repaired but probably would not look to good. Bottom line. They gave me a door to replace it. Yes you heard right. Wow. Now that’s a company that goes way beyond the call of duty. Thanks so very much. Great company to do business with. Don’t even think of another cabinet company.